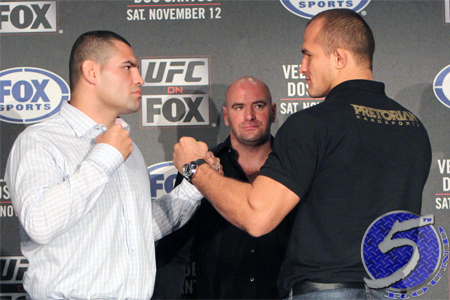 UFC president Dana White just confirmed the rematch between Junior dos Santos and Cain Velasquez (Pictured) less than a week ago, but that hasn’t stopped the Gambling Gods from dropping their two cents on the subject. Although dos Santos disposed of Velasquez in merely 64 seconds in November to capture the heavyweight hardware, “Cigano” opens as a slight 1.5-to-1 odds-on favorite to duplicate his success. Velasquez, meanwhile, checks in just behind as a +120 underdog. The two will tango December 29th in Las Vegas, Nevada. Either Mandalay Bay Events Center or the larger MGM Grand Garden Arena will host the New Year’s Eve weekend bash.